This classic is the benchmark against which all modern books about Nietzsche are measured. When Walter Kaufmann wrote it in the immediate aftermath of World War II, most scholars outside Germany viewed Nietzsche as part madman, part proto-Nazi, and almost wholly unphilosophical. Kaufmann rehabilitated Nietzsche nearly single-handedly, presenting his works as one of the great achievements of Western philosophy. Responding to the powerful myths and countermyths that had sprung up around Nietzsche, Kaufmann offered a patient, evenhanded account of his life and works, and of the uses and abuses to which subsequent generations had put his ideas. Without ignoring or downplaying the ugliness of many of Nietzsche's proclamations, he set them in the context of his work as a whole and of the counterexamples yielded by a responsible reading of his books. More positively, he presented Nietzsche's ideas about power as one of the great accomplishments of modern philosophy, arguing that his conception of the "will to power" was not a crude apology for ruthless self-assertion but must be linked to Nietzsche's equally profound ideas about sublimation. He also presented Nietzsche as a pioneer of modern psychology and argued that a key to understanding his overall philosophy is to see it as a reaction against Christianity. Many scholars in the past half century have taken issue with some of Kaufmann's interpretations, but the book ranks as one of the most influential accounts ever written of any major Western thinker. Featuring a new foreword by Alexander Nehamas, this Princeton Classics edition of Nietzsche introduces a new generation of readers to one the most influential accounts ever written of any major Western thinker. Kaufmann delivers a great book to help understand some of Nietzsche's obscure works. 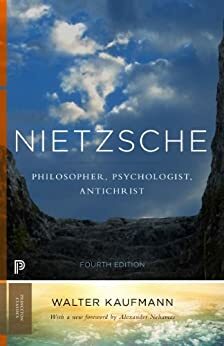 I have read Nietzsche multiple times and Kaufmann is a tremendous help in understanding some of the most misinterpreted issues Nietzsche presents such as the Death of God, the Overman, Eternal Recurrence, and his great Zarathustra. This book is fantastic for anybody who wants to appreciate Nietzsche's work more. Nietzsche stands among the truly great in history. It is fair to say that this biography, by Walter Kaufmann, is the most thorough and enlightening biography I've read. You truly believe you know both the man and the mind of this individual. I've read it twice and will surely read it again. This was vastly satisfying to me, because I have long been both fascinated and puzzled by Nietzsche. I feel that I understand his perspective much better now. If you want to understand Nietzsche, ignore dunderheads like Deleuze and read Kaufmann instead. Thomas Mann's judgment of more than half-a-century ago still holds: this is the best book on the subject to date. But avoid Deleuze and his copains. Ils sont plein du merde!